"Yoga teaches us to cure what need not be endured, and to endure what cannot be cured." Levels are designed to offer the student a thorough understanding of the postures and depth of the subject. Weekly, regular attendance is highly recommended and prolonged study at each level insures steady progress in the art and science of yoga. Standing postures are the foundation of the Iyengar method of yoga. In addition to developing awareness in action, they help improve muscular skeletal alignment. Iyengar yoga emphasizes alignment while developing strength, stamina, flexibility and balance. Backbends and other categories of postures are introduced in Level 2 classes. Props such as chairs, blocks, belts and the wall are used to help maintain safe alignment, to develop more awareness of actions, and to improve the performance of the postures. The Level III-IV class is for intermediate to advanced students and teachers who have been studying Iyengar yoga for a long time, with a self-directed home practice that includes long inversions. The teacher's permission is required (in advance) for this class. — Geeta S. Iyengar, “Yoga a Gem for Women”. The Iyengar method of teaching uses demonstration, precise instruction of position and actions to be practiced within a posture, and re-demonstration and correction if needed. Props are used to support the body in restorative postures. Certified Iyengar Yoga Teachers give individualized adjustments and corrections. Jennifer Beaumont with her children in Tolāsana. Introductory beginner's classes for those new to yoga or new to the Iyengar method, or for experienced yoga students to strengthen their practice of fundamental actions and alignment in asanas (postures). Learn how to align the body and improve functional movement and practice awareness in action. Sanskrit names and yogic philosophy terms are introduced. Classes for continuing students who would like to strengthen their practice of the fundamental actions and alignment in standing postures, forward and backward extensions, seated postures, spinal twists, and inversions. Practice awareness in action. Sanskrit names and philosophy terms are used and pranayama ("study of the breathing process") is introduced. All categories of asana, pranayama, and yoga philosophy are taught. This class is for teachers and serious students who have a self-directed at home practice. Ability to maintain Salamba Sirsasana for 5 minutes and Salamba Sarvangasana unsupported for 5 minutes is a prerequisite for this class. The teacher's permission is also required. Yoga practice contributes to emotional stability and health in many ways. This slower-paced class includes restorative postures and sequences to soothe and restore the nerves. Postures are taught with more modifications and props to accommodate older students or those who require special assistance and/or have mild chronic health conditions or injuries. 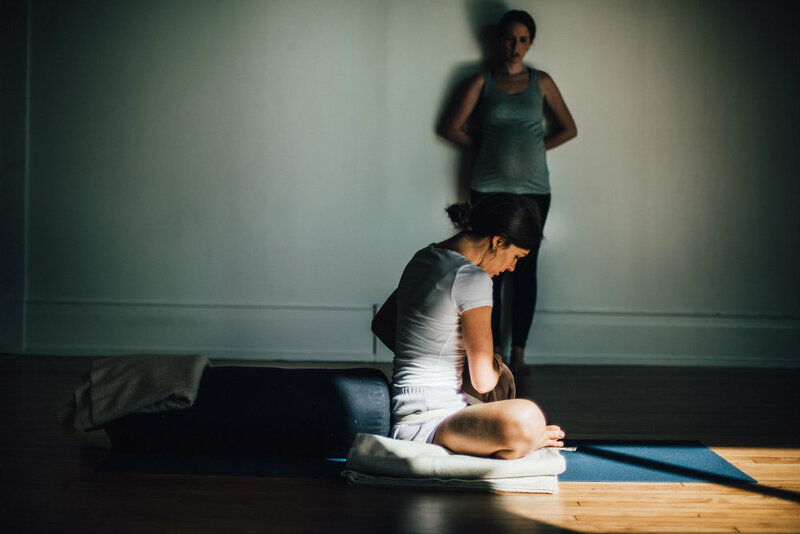 This class includes sequences and yoga postures that especially and specifically benefit and strengthen women's bodies and minds in the transformative experience of pregnancy. Physical, nervine, mental and emotional strength is developed through the mindful practice of yoga postures. Breathing exercises and relaxation techniques are taught to help calm the nerves through the experience of pregnancy, birth, postpartum healing and beyond. Pregnant students may also practice in Jennifer's Level 1 and Level 1-2 classes when Prenatal Yoga is not on the schedule. This mixed-level class includes sequences and postures that especially and specifically benefit women in various stages & cycles of life, from the bent-over postures of motherhood, to the fluctuating hormones of menses & menopause. Pregnant & menstruating students are welcomed and encouraged to attend. Yoga for children should be as dynamic and playful as the joyful innate nature of the child is to be present, alert, aware. Yoga is very beneficial for children's overall health and development. The practice has great potential for protecting the physical alignment of the body and uplifting the emotional well being through the vital development phases of a child’s growth. The asanas (postures) are the physical foundation of the practice through which other aspects (moral, philosophical) can be learned. Through preparatory movements and actions, children learn to coordinate the two sides of their body through a playful yet methodical introduction to the yoga asanas. While the emphasis is upon mobility and agility for the younger ages, gradually the postures are improved and perfected. We will also learn and practice poses that are soothing for stomachaches, poses that help with headaches, those which help for sore necks and backs, and much more! This quickly-paced playful class is modeled on Jennifer’s observation of the children's yoga program taught at the Ramamani Iyengar Memorial Yoga Institute in Pune, India. This class accepts children as young as 4 accompanied by a parent, but is ideal for older children, especially those age 8 & up. This class is offered in monthly sessions when enough students preregister. When kids and teen yoga class is not offered on the weekly schedule, older children and teens are welcome to attend regular classes with parents, and teens may also attend without parents. — Chanchani, “Yoga for Children"
At IYCGR, we believe everyone deserves access to the healing of Iyengar Yoga. Where do you fit on the sliding-scale? If I pay less when I can afford more, I make IYCGR less accessible to those in financial need. There may be times when I do not have cash to give, but can offer other gifts (labor, garden veggies, etc), which I will discuss with my teacher. Is available for students with health conditions/injuries only at this time. Please contact Jennifer@iycgr.com to discuss your specific needs. Please remove your shoes before entering the asana hall. Shoes belong in the vestibule at the front door in the shoe racks. Please arrive at least 5 (or 10 minutes for first visit) before class time. Parking is available on Division Ave. and Goodrich SW. Please leave shoes in the vestibule at the front door in the shoe racks, and personal belongings outside the classroom door: no shoes or drinks in the Asana room, please. New students must register before class begins. Please let your teacher know before class if you have any medical issues or concerns, or if you are currently pregnant or menstruating. Please do not wear fragrances; they can be irritating to others.